Funny, y'know? After all the highways, and trains, and the appointments, and the years, you end up worth more dead than alive. "Alice Neel presented a varied and renowned pantheon of late twentieth century personalities during her distinguished career. And as the recognition of her importance in the history of art continues to increase, so do the reputations of many of her subjects. A surprising number of Neel's portraits include men costumed in the uniform of American business and middleclass respectability – the suit. Although Neel stated that, "I looked around and the world and its people terrified and fascinated me. I was attracted by the morbid and excessive and everything connected with death, " not all of her suited men reflect the depressed and forlorn dilemma of Willy Loman. Alice Neel's men in suits, however, clearly document an era in American history dominated by the ascension of business, finance, and corporate power, and reveal her astute recognition of important aspects of identity, role playing, and self-concept. For Neel, suits represent an enforced identity that often stifles the individual personality regardless of age, race, or career. 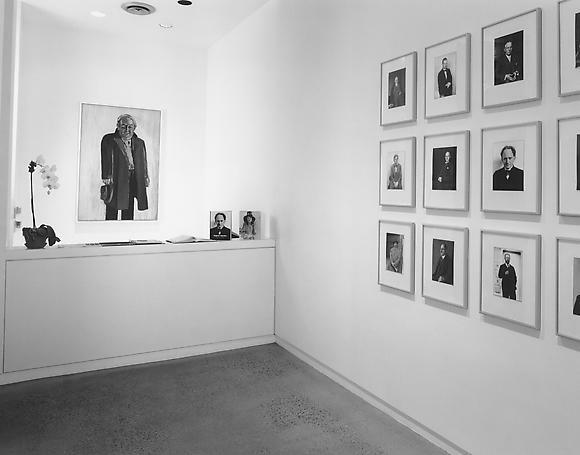 Her men in suits include art world professionals – museum director Jack Baur (1974), art gallery owner Harold Reed (1970), and art critics Gregory Battock and David Bourdon (1970); leaders of the civil rights movement – Hugh Hurd (1964), and James Farmer (1964); and members of the financial community – Walter Gutman (1965), and Timothy Collins (1971)." Also on view will be photographs by August Sander (1876-1964). Sander set out to document all "types" of humanity in pre-war Germany in his portfolio Citizens of the Twentieth Century. As a complimentary exhibition to the Neel paintings, these photographs focus on the suited professional: industrialists, entrepreneurs and businessmen. Looking at these photographs the sitters' identity fluctuates between the individual and the given occupations. Both exhibitions will be on view from Wednesday, March 4th through Saturday, April 25th, 1998, with an opening reception from 6 to 8 o'clock on March 4th.